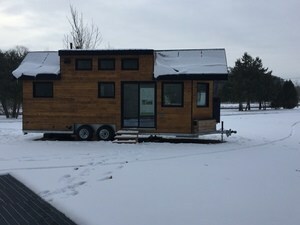 It was cool to see a tiny house parked by the Rideau river yesterday at my old stomping grounds–near the Azrieli School of Architecture & Urbanism, where I taught for 14-years. But it would have been a heck of a lot nicer to see it inhabited. And for that matter, how about parking a few hundred of them there for students, grads and visiting faculty to actually use/benefit from? Close to everything including the O-train, Carleton University’s campus, downtown, you name it. 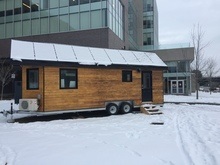 I was looking at that tiny home the other day from the window of the Richcraft Hall where I was speaking to the Sustainable and Renewable Energy Engineering Society and was thinking the same thing. Why aren’t there more of those available for rent on Campus? I also loved the fact that the home had a sweet roof made of solar panels…my favorite.